How Do You Spell Venue? 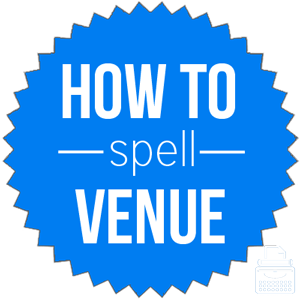 Home » Spelling Dictionary » How Do You Spell Venue? Spelling of Venue: venue is spelled v-e-n-u-e. Definition of Venue: A venue is a place where events are held, such as concerts, sporting events, musical acts, etc. It also specifically refers to the place in which a lawsuit might or should be tried. A venue doesn’t have to be any particular size, and they can range from large to small. Huge concert and sport stadiums can seat hundreds of thousands of people, while smaller, more intimate venues might seat only a few hundred people. Pronunciation of venue: venue is pronounced ven-you. What does venue mean? A venue is a place in which specific events are held. Venue is a noun, and thus, can function as a subject or object of a sentence. The plural form of the word is formed by adding “-s” to make venues. The jury requested that they change venues for this trial. The band is still looking for venues for its upcoming tour. There are no common phrases or idioms that use the word venue. Depending on whether the context of the situation is related to law or not, there are a few different synonyms for venue. The word venue is a noun that refers to a place or location where a specific type of event is held. Since it is a noun, it functions as either a subject or object in a sentence. By adding an “-s”, the word becomes plural.